Google images is a great way to get traffic to your website. You have the unique advantage of having a product based business which means that you can get your photos to show up on Google images. You have an even better advantage over your competition if you learn to use choice jewelry keywords and label your images correctly. Correctly? You mean label them as what they are? Well, yes and no. The first mistake that people make when they load their images onto a website is that they leave the image label just as it is labeled by the camera. So, you see images with the original label 118.jpg or whatever the sequence number is from the camera. The second most common mistake is labelling images in a way that only makes sense to the person who labelled them. For example if I have a pair of small dragonfly earrings in light purple I might want to label the image "e-dry-sm-lp." This makes sense to me because when I am searching on my computer to upload the image I instantly know that "e" is for earring, "dry" is for dragonfly... you get the idea. While this may make things easier for me to find photos, absolutely no none online will be searching the keyword "edry-sm-lp." They will likely be searching "small dragonfly earrings" or "purple dragonfly earrings." By the same token, you can pretty much guess that when people are searching for an emerald necklace they won't be keying in 118.jpg into the Google search bar, however when they type in emerald necklace, Google will return pages and pages of emerald necklaces. 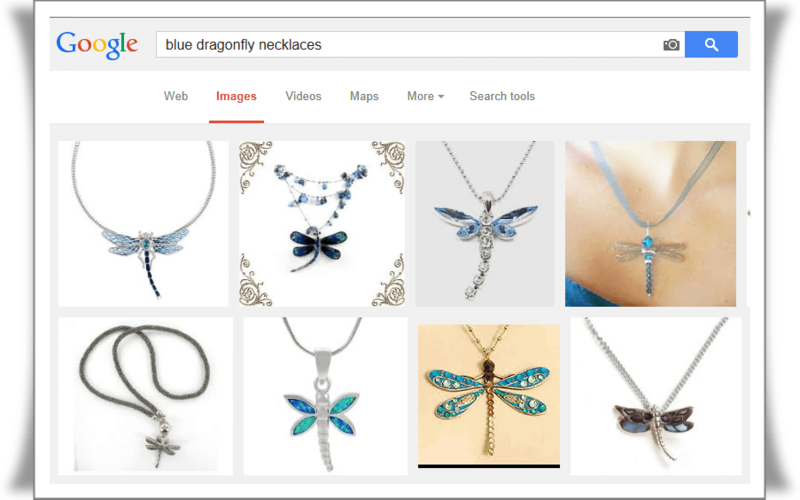 Alongside of showing the visitor website pages containing emerald necklaces Google will also provide the option to search a large variety of items on Google images. Near the top of the page Google will always display images and the option to search for more images. With a product so visual as jewelry it makes much more sense to search through images until you see something that appeals to you rather than searching through an endless number of websites until you find an emerald necklace that suits your taste. Here is the deal though, is emerald necklace what people are searching for and if they are how many emerald necklaces are out there? When people are searching for an emerald necklace are they looking for genuine emeralds or the colour emerald? These are all questions you need to ask when doing research for keywords that people may be searching. Let's say you are selling a Black Onyx necklace do you think it would be a good idea to label your photo Black Onyx necklace? It makes sense doesn't it because if the consumer is searching for a Black Onyx necklace then that is what they will key into the search bar... right? Yes, that is true, but did you know that there are more Black onyx necklaces than there are people searching? So, then what? Surprisingly Onyx necklace (without the black) has not only a higher number of people searching, using those exact keywords, but it also has much less competition. It would be a far better keyword to use for labelling your image than using the word black with it. 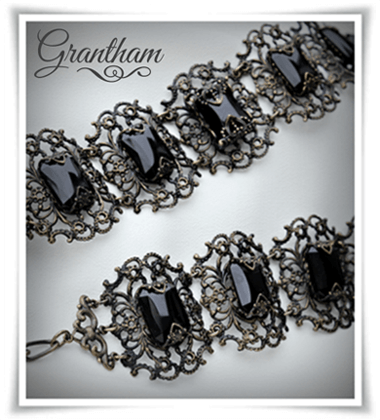 Just as well, we have the keywords "black necklace" which is also highly searched with a low supply online. That is not to say that there are few black necklaces online, but rather there are fewer people labelling their images as "black necklace." Using this keyword would more likely turn up your image in Google images which would potentially bring more visitors to your site. This is a start, but remember that you have to have good photos and jewelry that people are interested in so that they will click on your photo in Google images and visit your website. The first part of the battle is just getting your photos to show up in the search results. Once you are there you can use website analytics to determine how many people are clicking through to your site from Google images. Now that we have covered how to properly label your photos to be found on Google Images let's look at how we can further boost your chances of turning up in the search results. I am talking now about copy. This means the title you use for your item as well as your product description. Hand in hand with your image label is your product title. Both are equally important in terms of keywords and getting picked up by Google Images. In fact sometimes your images can be found simply by the product title even if the image labelling is not optimum. So, although you may love the idea of naming that necklace "Grace necklace", you have to consider whether anyone will be searching for a Grace necklace online. If the necklace that you want to call "Grace" is an Art Deco pearl necklace you would have a better chance of having the image found with a title description of "Art Deco Pearl Necklace" as it is more likely that people will be searching for Art Deco style jewelry or a pearl necklace or both. I know it can be disappointing to have a great title in mind for a piece of jewelry only to have to relinquish it to the idea of a seemingly ordinary title. Sometimes it is that seemingly ordinary title that will bring in the traffic. Experiment with titles by either by tagging the more creative name at the end of your keywords in the or by having a secondary title where you can work in your desired creative name. A good example of this would be "Art Deco Pearl Necklace - Grace" or "Art Deco Pearl Grace Necklace." You may need to be careful with slipping the word "Grace" between your keywords if it means breaking up an exact keyword that will potentially bring in good traffic. So, if "Art Deco Pearl Necklace" is a good keyword for traffic you may not want to interject "Grace" between those words. 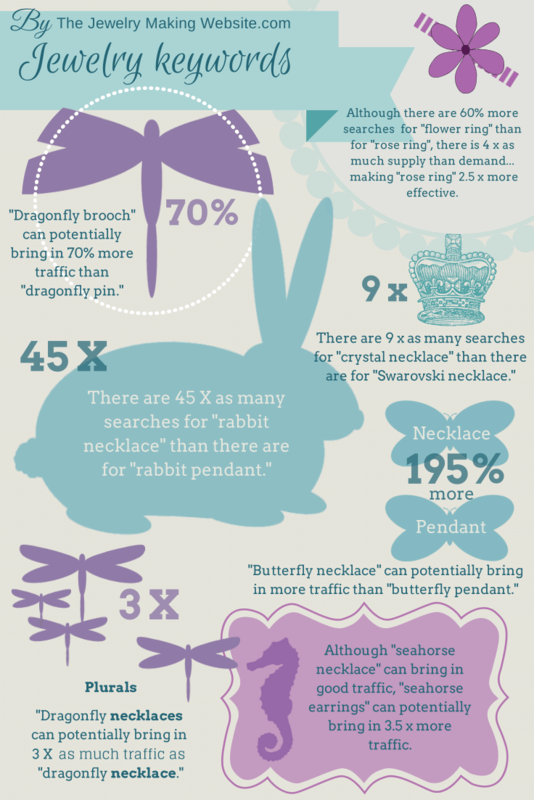 The best jewelry keywords tend to be a string of two to three words put together. Once you have established a good keyword it is of great importance to keep the two or three words as an exact match. This means you do not add an "s" at the end or interject any other words in between. You enter them on your site just as they appear in your keyword research information. Another way of including names in your product title without messing with your vital keywords is to snap your photos with a little white space. At the top of your image or on the top right you may have a little blank space where you can add a title. By using a photo editing program to add type you can include that unique name in your images. Because the type is embedded into the photo it will not affect your keyword traffic. Experiment with different titles and keywords and give it a couple of weeks before you search Google Images to see if your images are turning up. If you would like to find keywords for your jewelry you can either purchase a keyword research program or you can use Google Keyword Planner. To use the planner you will need to sign up for an AdSense account. To find keywords that will help you get traffic from Google Images I recommend that you research on a regular basis as supply and demand changes all the time.